"Well, the question is, how can you know anything about an extinct ecosystem and how could you assume you could ever control it ? You have plants here in this building that are poisonous, you pick them because they look good. But these are aggressive living things that have no idea what century country (think European Yew) they are living in and they will defend themselves, violently if necessary." 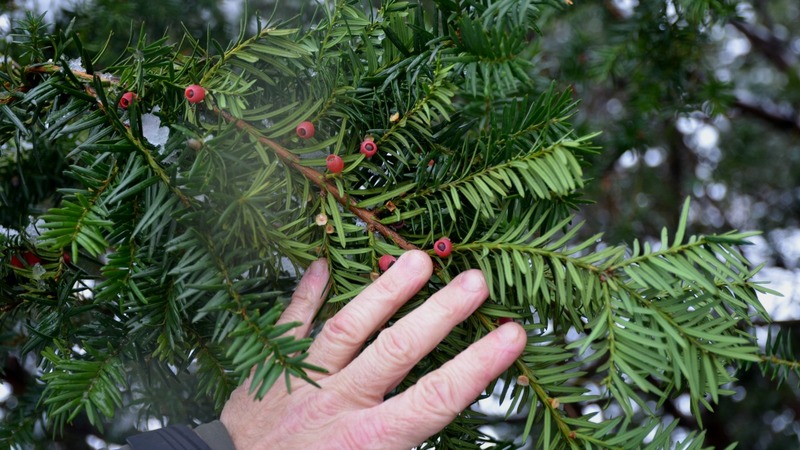 Over here in Sweden, the landscapers use this Yew plant everywhere. What appalls me is their choice to incorporate it within family housing complexes where there are large numbers of children, often unsupervised. The plant is also chosen for it's ornamental value in Christmas decorations such are wreaths which are hung on a door in the house. 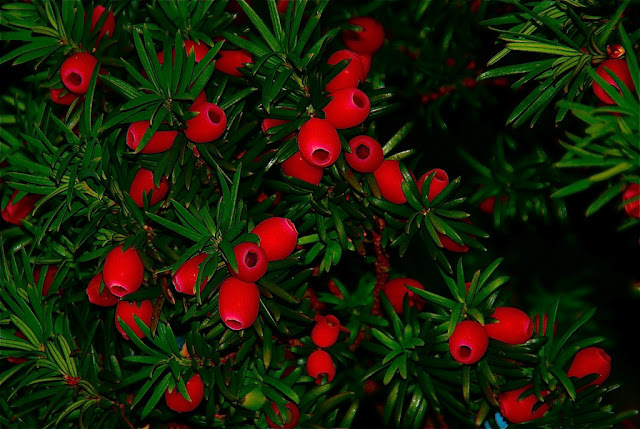 The deep evergreen foliage in contrast with the bright red berries are adittedly very attractive, but they are dangerous to children, especially young toddlers who will put anything in their mouths. English Holly is another one of these attractive ornamentals used at Christmas time, but their berries are also toxic. The white berries of Mistletoe is yet another toxic plant used on this holiday. Poinsettia is another. The scary thing is the red berry is sweet to the taste, but it's the seed that is toxic. I'll provide some reference examples below at the bottom of this post. Here's an example of a common Tew many grow as an ornamental in their urban landscapes. 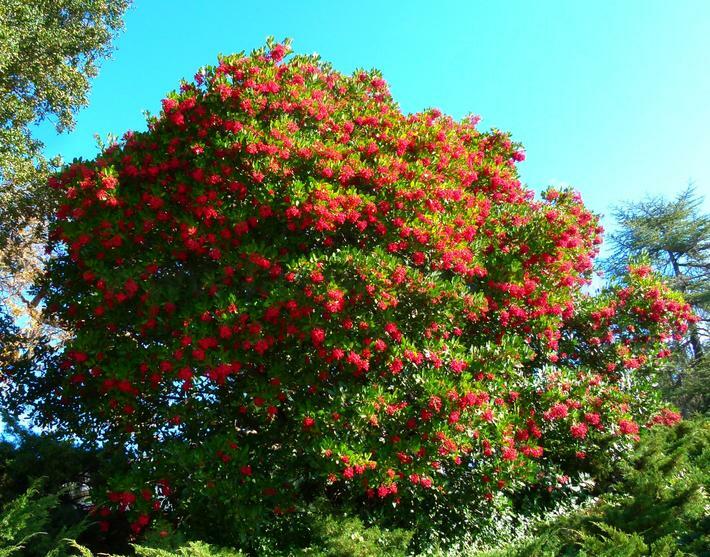 Many housing complexs and city parks with also plant them as they admittedly are a very handsome evergreen shrub or tree with contrasting red berries. But the seed or more commonly called, berry, can be deadly poison within one to two hours after ingesting them. In actual fact, the fruit is not really a berry at all. As you can see from the way it has a hole in the end like the picture at the right here. The outer covering (called aril) as it matures shrinks back exposing the seed which is the true fruit. The red outer part is technically is called an aril. A well known aril is the spice mace, which is the outer covering of a nutmeg. Pomagranites also fall into this description. Interestingly, the red flesh of this Yew berry is quite sweet, but again it's the seed inside is deadly poisonous. 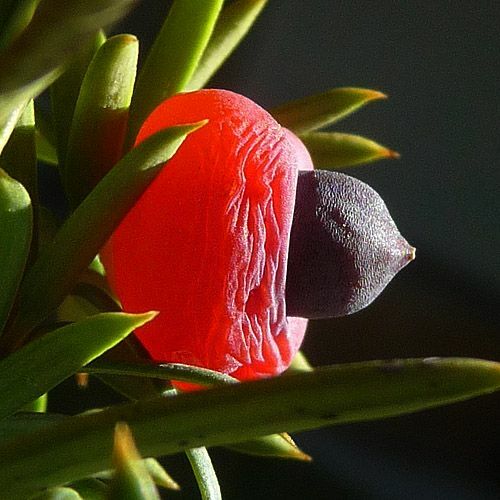 This doesn't matter to birds, because their quick digestive system passes the seed through unchanged, and like most berries, this is how the Yew distributes its seeds. Not that the Yew is capable of knowing that of course. 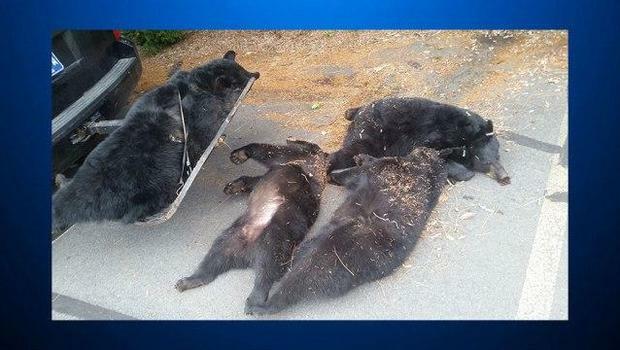 But the more thorough digestive system of an animal would attack the seed's coating and poison the animal like it did to those four bears in the article above. Below is a plant profile of the Yew. This plant is a large evergreen shrub or small tree with leathery deep green leaves which produces small white flower clusters followed by showy clusters of red berries. In the urban landscape, it will only require deep watering once a month in summer when established. In most of it's native area probably not necessary to water this plant if roots are deep enough. This deeper root infrastructure can be obtained if the gardener or landscaper is smart and patient enough to train the plant by starting out with a one gallon year old specimen. They can grow from 8' to15' feet tall and 8' feet wide. The berries are edible and not dangerous like the other ornamentals I've discussed here. If a child did happen to eat one, there is not much flavour and not really sweet at all. More importantly, they will attracts birds and other wildlife who will use them as a food source. The bottomline here is you need to use your head and think about what plants you choose as appropriate to the safety of your landscape, not only for wilslife, but especially young children.